At Pratt and Larson we were lucky enough to get one of the first prototype GlazeTech kilns. Its worked out great for us because it is really important for us to have ongoing testing. We do custom color matching all the time here and we have crystal growth issues, materials issues… that make it so testing on a regular basis, in an accurate kiln, is really important and the GlazeTech has worked great for us. On the GlazeTech kiln it has a controller that gives us total control over what is going to happen in the kiln. It’s got 8 segments. We mostly use 3 or 4 segments. We can replicate what we are doing in our larger kiln by doing a data log and recording what is going on in the big kiln and reproducing it exactly in the GlazeTech. We put the data logger on the GlazeTech, and the controller is running it spot on. I have the graph which is showing that it is working so well. So the GlazeTech is just right for us for it’s size and shape. The height (on the optional rolling stand) is really handy and the size makes it so we can just park it anywhere we need to. Space is very critical in a studio like ours. We have so much going on, I need to be out of peoples way, and the little lab kiln is just right. Last night I needed to see one result on a 2×4 tile. I didn’t want to dedicate an entire large kiln to have to look at what this glaze would look like on this tile. So I was able to use this kiln and it turned out great. I put in a few other tests. We can put in aproximately 3 one foot shelves in there stacked up and get a lot of volume, get a lot of tests done. We can fire 2 6×12 tiles side by side which is very handy, again, not having to fire up our large kiln. Last nights firing bent this Cone 4 just right for us. Working with Skutt Kilns has been just great. 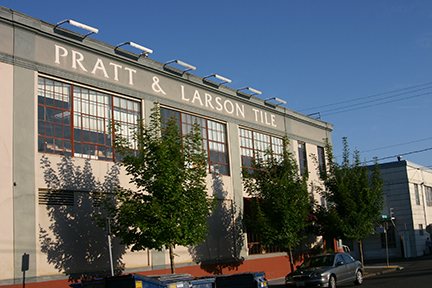 Pratt and larson has been around for 30 years and they have been working with Skutt Kilns from the start. Its not tjust that their local, they have great customer service, they have a great Tech department. We call them with questions , they help us with problems. We do our maintenance here. The parts are readily available, easily installed. Everything works just great that way. So its been a good relationship and a long one with Skutt kilns. To hear more from Andy about the GlazeTech watch the video interview.